A pair of brushes to do the dirty work for you! 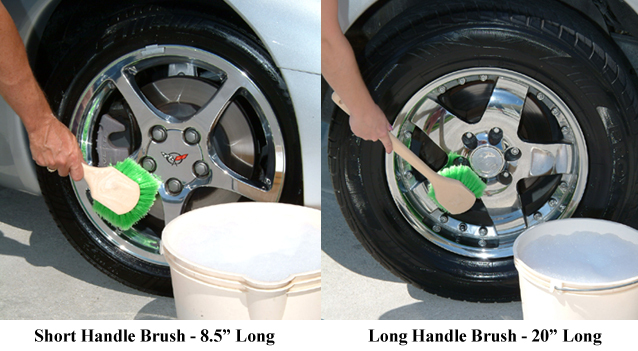 A good set of tire and wheel brushes is a must among your detailing supplies. This pair of well-made, indestructible brushes are practical, efficient and safe for all wheels. Both have hundreds and hundreds of densely packed bristles, feathered at the tip for gentle agitating of any wheel surface, regardless of delicacy. The bristles are sturdy enough to attack tough road grease and grime on your tires as well. They are constructed of alkaline- and acid-resistant, 2” fibers, mounted on non-slip, heavy-duty plastic handles. The shorter brush is 8 ½” long with a 5” handle. 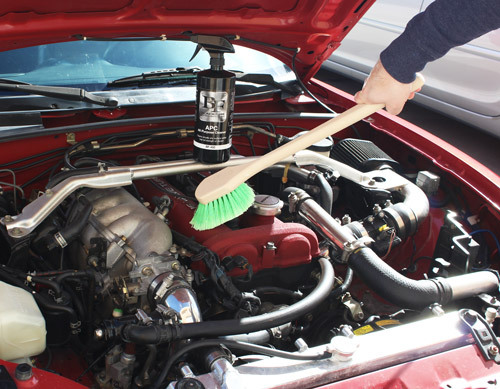 It’s great for close-up scrubbing of your tire and wheel surfaces. The longer, 20” brush allows you to reach between wheels and behind tires and wheel wells, while keeping your distance. Which ever style you prefer, you can be sure these brushes will give years of service. Upkeep is simple—they rinse off easily in clean running water, and can be hung by the hole in the end of the handle between jobs. Specially formulated tire cleaners and dressings will complete the circle of good wheel and tire care. A potent, yet, environmentally safe wheel and tire cleaner, like Pinnacle Gel Wheel Cleaner supplies a good foundation for application of Black Onyx Tire Gel, which is a quality protective and glossing dressing. Using these brushes and the suggested product will guarantee satisfaction with the results.